While we all know Samsung for its supremacy in the smartphone market and as a leading maker of home theater systems, the fact that it produces a plethora of other electronic goods can sometimes be forgotten. In an effort to ensure that everyone gets to hear about its range of home appliances as well, the Korean tech giant on Wednesday took the wraps off what it called a “global culinary initiative” involving Michelin star-rated chefs who’ll be collaborating with Samsung designers and engineers to create the company’s next generation of high-end home appliances. “These leaders in the international culinary community will serve as ambassadors and consultants for Samsung, providing input on product design and technological innovation, as well as inspiration for home cooks,” Samsung said in a statement. To launch the “Club des Chefs” initiative, the company on Wednesday night introduced some of the chefs involved – including Michele Troigros (Maison Troisgros in Roanne, France), Eric Trochon (Semila in Paris), Chritopher Kostow (The Meadowood in Napa Valley), and Frank Castronovo and Frank Falcinelli (Frankies Sputino in New York) – at a special event in Manhattan’s SoHo neighborhood. The gathering took place in Samsung House, a temporary space designed to show off the company’s current range of home-based products. The showroom, or as Samsung prefers to call it, “a custom-designed and beautifully appointed home environment location,” will be opening its doors to the public this weekend, should you want to drop by. These include the new and rather cumbersomely named ‘Four Door Sparkling French Door Refrigerator’ which incorporates an automatic sparkling-water dispenser powered by SodaStream – an “industry first”, according to Samsung. 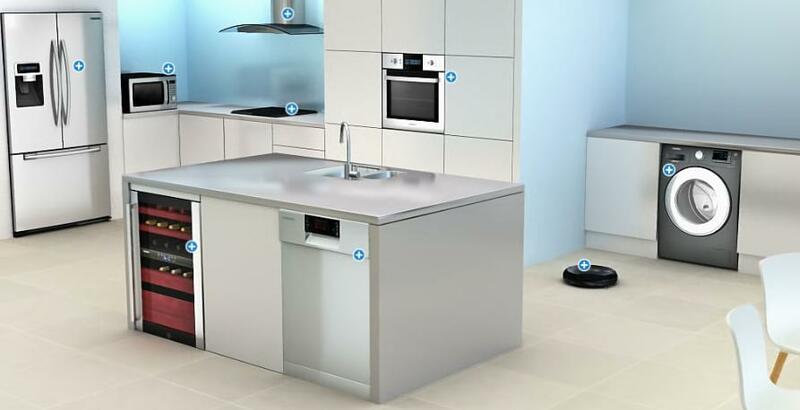 Samsung, today one of the biggest tech companies on the planet, is clearly intent on announcing itself in the home appliance sector as it seeks to replicate the success it currently enjoys in other markets. The first Club des Chefs products are likely to hit stores in 2014, Samsung said.